"I made this recipe for my mother's birthday over 20 years ago. Everyone loved the Brussels sprouts! Then I lost the recipe. Recently as I was going through my mother's recipe cards, I found the copy I made for her. I had forgotten what an attractive dish this is. It is as good as I remember and best of all, it still gets rave reviews!" Fill a large pot 3/4 full of water and bring to a rolling boil. Add Brussels sprouts and carrots, bring back to a boil, and cook vegetables until tender, 8 to 10 minutes. Drain. Heat butter in a saucepan over medium heat; cook and stir onion in the melted butter until tender, about 5 minutes. Add beef consomme, apple juice, cornstarch, lemon juice, brown sugar, and cloves. Cook, stirring often, until sauce is thickened, about 5 minutes. 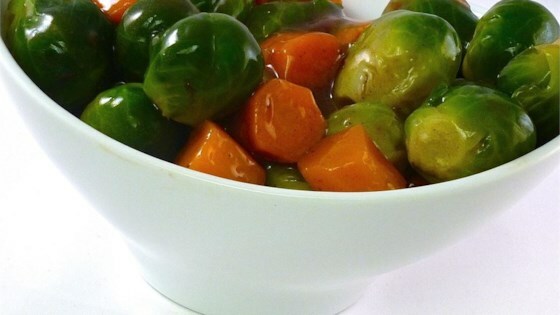 Fold Brussels sprouts and carrots into sauce. If Brussels sprouts are large, score an X into each stem. Two 10-ounce packages of frozen Brussels sprouts may be used instead of fresh. Baby carrots may be used instead of cut carrots. I have made this with both frozen and fresh brussels: definetely go with fresh! Wow everyone ate their Brussels sprouts! Will definitely make again! This was a twist on brussel sprouts and it was pretty good. Sorry...I didn't use beef broth or the brown sugar. Was a lovely dish! Took it to lunch and ate it cold and it was still yummy! Will totally do again! !